In addition to the creative imaging functions, the PowerShot N100 camera offers a 5x optical zoom, a 24mm Wide-Angle f/1.8 lens, a 12.1-Megapixel High-Sensitivity CMOS sensor and Canon's DIGIC 6 image processor to help provide stunning image quality. 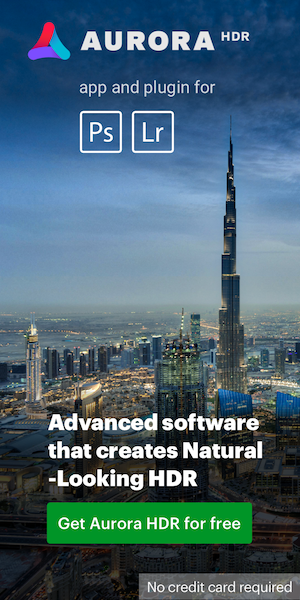 Users also have the ability to quickly access and then record high-quality 1080p Full HD video with the dedicated movie button. To make choosing the ideal setting for each shot convenient, the camera's Intelligent IS System allows the PowerShot N100 camera to automatically select the optimal image stabilization settings according to the shooting conditions, so shooting in dimly lit or bright situations can be easy and accurate. 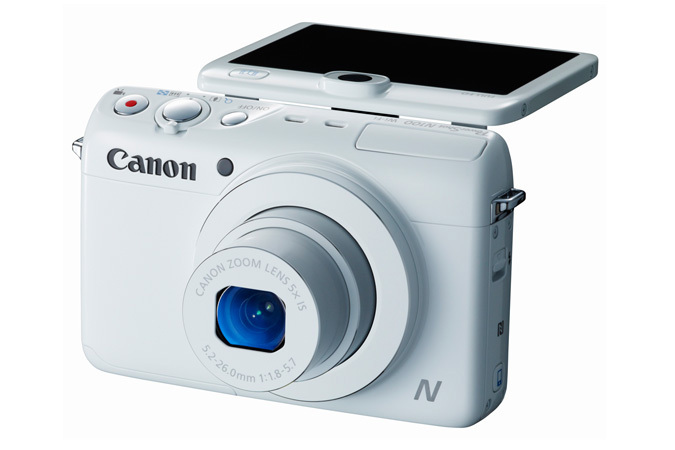 The PowerShot N100's new body design gives the camera a portable shape. The three-inch capacitive touch, tilt LCD panel allows users to capture images at unique angles, up to 90 degrees (more info). 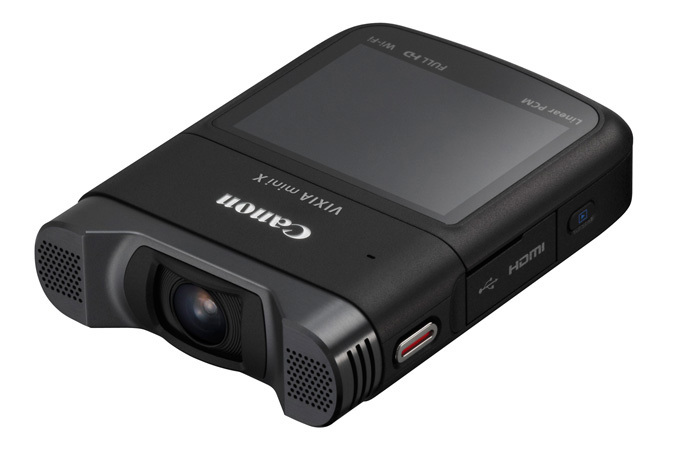 The VIXIA mini X compact personal camcorder features a Canon f/2.8 fisheye lens (160 degree MP4 movies/170 degree photos /150 degree AVCHD) allowing the shooter to challenge their creativity by allowing new and unique perspectives of filming. Equipped with a 12.8 Megapixel High-Sensitivity Sensor and Canon's DIGIC DV 4 Image Processor a shooter can capture superb image quality in a variety of shooting situations, including low-light shooting situations which may not be the most ideal. Now with Linear PCM audio recording (supported in AVCHD/24 Mbps recording mode) shooters will experience outstanding audio quality. The built-in high-quality microphone helps to capture terrific audio quality as well, while Audio Scene Select helps optimize the audio recording by selecting from eight pre-determined audio modes and determining which setting is best based off the shooting conditions. Additionally the built-in auxiliary microphone/headphone terminal includes a manual audio level control, providing the shooter with an enhanced level of audio customization as compared to the VIXIA mini camcorder (more info). Three new Canon VIXIA HF R-Series camcorders, the VIXIA HF R52, VIXIA HF R50 and VIXIA HF R500 all feature outstanding image quality powered with a Canon 3.28 Megapixel Full HD CMOS Image Sensor, and the DIGIC DV4 Image processor, providing shooters with the ability to capture vibrant 1920 x 1080 resolution Full HD video. Together with the improved 57x Advanced Zoom and SuperRange Optical Image Stabilization, shooters can capture different types of action, like a day in the park, or on vacation sightseeing. The VIXIA HF R-Series also features Intelligent IS, which automatically chooses from four different modes to help provide the optimal image stabilizations based off of certain shooting conditions. 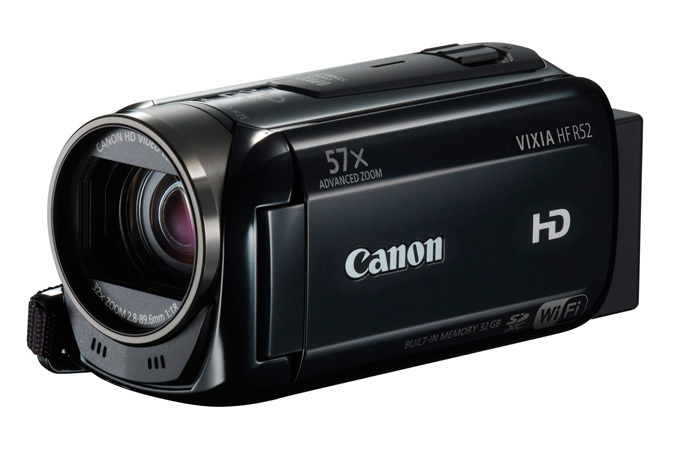 From their child's first steps to the championship soccer game, the new VIXIA HF R-Series camcorders continue to offer users the outstanding image quality and zoom capabilities users have become accustomed to from the VIXIA line. A three-inch capacitive touch panel LCD allows the user to quickly and intuitively switch between settings without affecting their ability to capture their desired images (more info). In addition to enhanced connectivity and artistic options, the PowerShot SX600 HS camera features a long-zoom range in a compact point-and-shoot camera body. 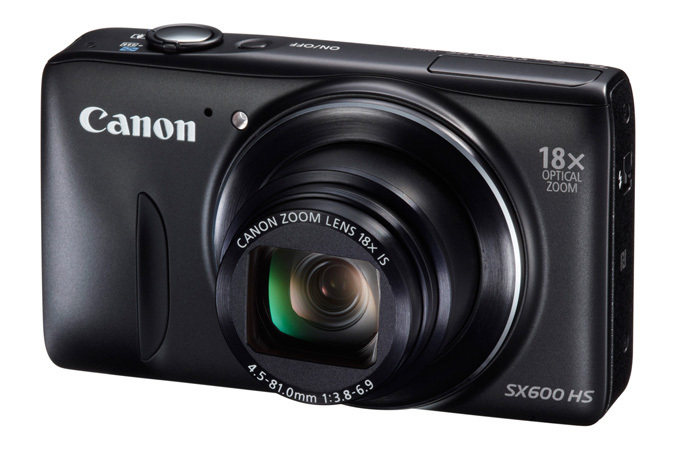 Equivalent to 25-450mm, the SX600 HS camera's powerful 18x optical zoom provides users with the high-quality optics the pocket-sized Canon PowerShot SX camera series is known for. The SX600 HS camera combines a 16-Megapixel CMOS sensor and Canon's DIGIG 4+ Image Processor to create the Canon HS SYSTEM allowing for excellent low-light performance.The PowerShot SX600 HS digital camera is expected to be available at the end of February 2014 in red, white or black for an estimated retail price of $249.99. The PowerShot ELPH 340 HS digital camera, successor to the ELPH 330 HS, features a 12x optical zoom lens which is equivalent to 25mm-300mm. Great for low-light scenes, the 16-Megapixel High-Sensitivity CMOS sensor and DIGIC 4+ Image Processor work together to create the Canon HS SYSTEM helping to ensure images are captured in detail in dimly lit situations. 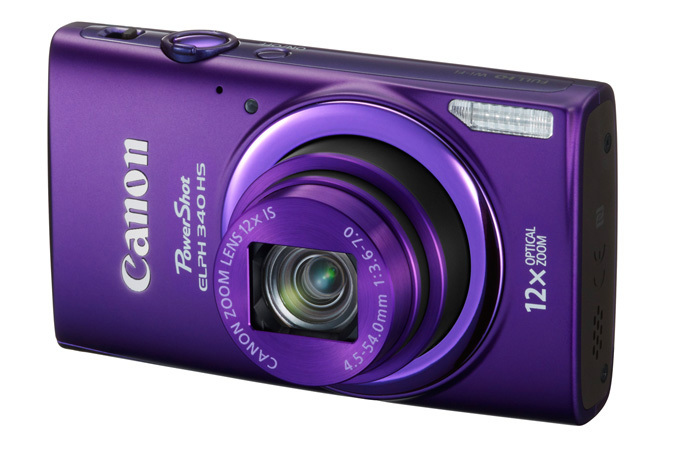 The PowerShot ELPH 340 HS is expected to be available in March 2014 in purple, silver or black for an estimated retail price of $199.99 (more info). This entry was posted in Canon and tagged CES 2014. Bookmark the permalink. Trackbacks are closed, but you can post a comment.